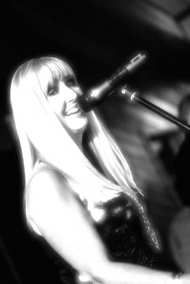 The Vicki Roberts Band offers a wide selection of music both live and recorded. From the acoustic sounds that you enjoy while dining to the dance songs that will get you movin and shakin! We are available for hire for all sorts of venues but please come out and see us some time at any of our regular performances in and around Annapolis. If you are planning a wedding or any other special occasion, we can also provide some recommendations for catering services,photography, video etc. We want to help make your wedding as wonderful as it should be. Our sounds are "one of a kind" and are fees are reasonable. We will work with you to plan the songs for your event. Whether it is Halloween, Christmas , July 4th or your birthday, we will work with you to put together music just for the occasion. We can set up on your deck, in your garage, under a tent, in your yard or in your livingroom. Or perhaps you have rented a hall or banquet room. We will work with you to play the music that you and your guests want to hear. We fit nicely in restaurant/bar lounges or outside in the summer at your dock bar. If you are a business owner and would like us to perform at your establishment we fit nicely in restaurant/bar lounges or outside in the summer at your dock bar.